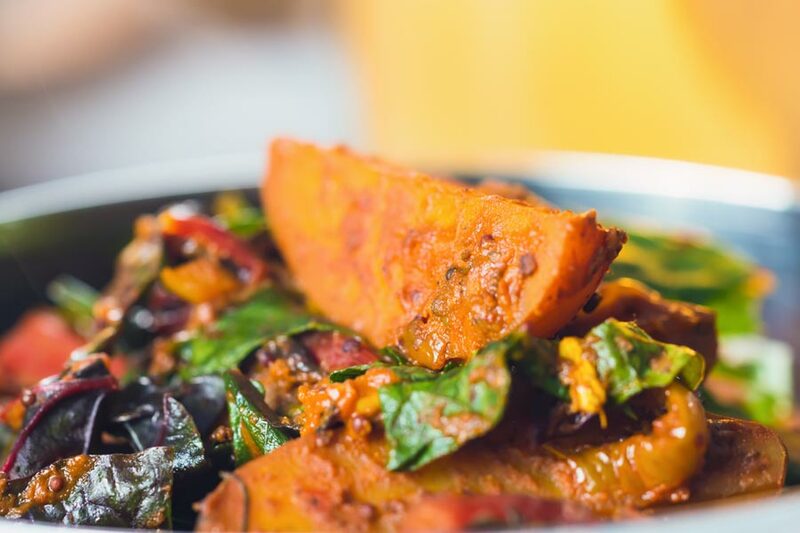 Saag Aloo is a long standing favourite curry of mine, the move from spinach to chard adds a depth of iron rich earthy flavour to an already wonderful dish! 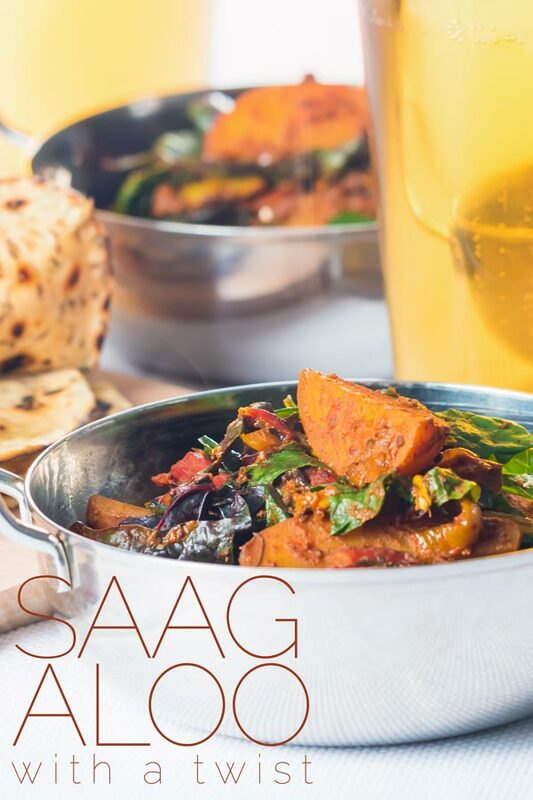 Saag Aloo With A Twist. Saag aloo is an absolute favourite curry of mine. It is simple and quick to make and is a great introduction to Indian food. Due to a spectacular failure of my ‘saag’ or spinach crop a couple of years ago I once traded out spinach for swiss chard. It transformed one of my favourite dishes into something really magical. 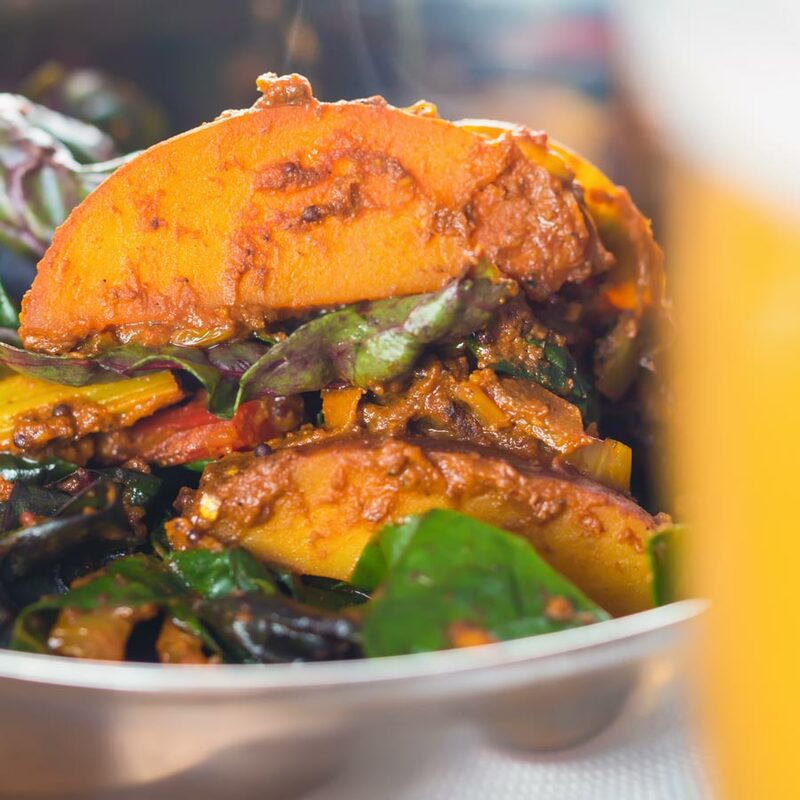 The swiss chard adds an iron-rich flavour that punches through the spices wonderfully. My version of saag aloo is a vegan recipe, much like my aloo gobi curry recipe, which is a potato and cauliflower curry. It is a typically a northern Indian dish and literally translates as Spinach Potato. You could swap out the chard for either spinach or kale in this recipe if you wanted. You can even make it with savoy cabbage. However, the chard works exceptionally well and the texture from the stalks adds a further dimension. My all-time favourite food is hot and spicy. As a result, I use a pretty hot chili and use the whole chili, seeds included. However, you can scale back the heat as far as you like by removing the seeds and membrane of the chili, or using a milder chili. Hell, you could omit the chili entirely if you wish. Food to my mind should be made to make the people eating it smile, so if you are not a fan of the chili burn don’t do it! People often think that there are rules when it comes to spice. They are wrong! You are the cook, you define how hot or spicy a recipe is. make sure you make yourself happy, you have nothing to prove! 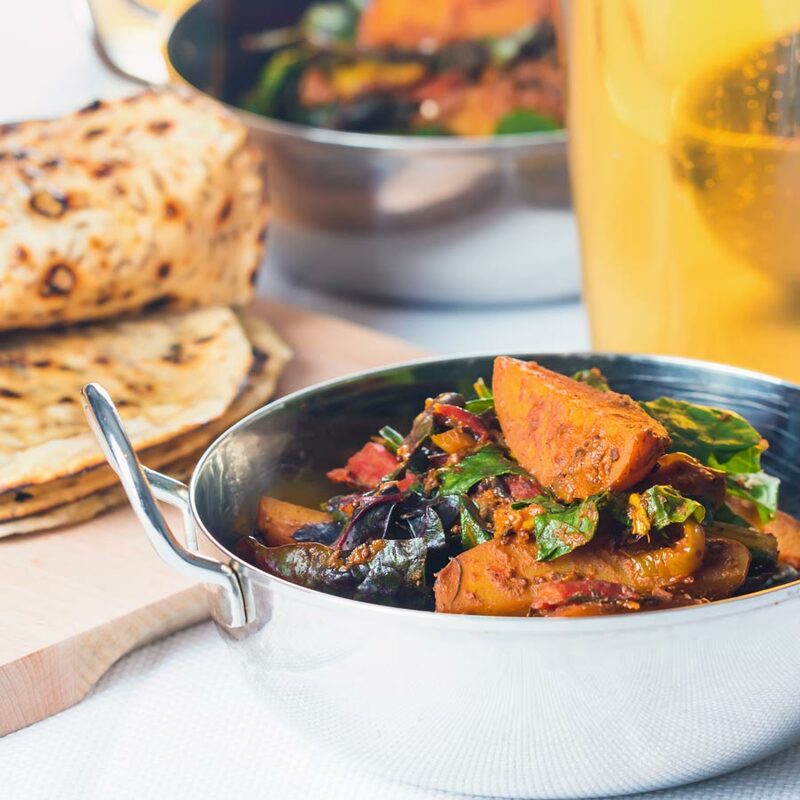 What Goes With Saag Aloo? Whether you go chili or not one thing I definitely implore you to try as an accompaniment is a chapati. Indian food loves flatbread and vice versa! For me, part and parcel of the whole experience of Indian food is cleaning your bowl using the last of the chapati. Indian cuisine has loads of varieties of flatbread. I personally prefer Naan bread you cannot beat chapati for pure convenience and speed. 10 minutes work at most and two minutes cooking per bread and you have the perfect side to my Aloo Saag recipe. In fact, not just this recipe any Indian curry! Thanks Linda… Indian food really is not all that intimidating at all, it is just a case o blending slightly more flavours than traditional European food but technique wise it is very simple. I am loving all the flavors and textures of this beautiful recipe! Just wow! Looks like I have most of those ingredients on hand already. I’ll have to give this one a go. Thanks for sharing! Have fun it’s a really tasty dish. This is beautiful and with that ingredient list it’s obviously going to be packed with flavor! I adore curry so I’m all in! I LOVE all the spices in this dish, I can imagine it would smell so amazing whilst cooking! Sounds so good, thanks for sharing! I love spicy food ! This is definitely right up my alley- nice touch of throwing in vegetables! Thanks for sharing Brian. This looks so good, Brian! Brian I love how your recipe is full of flavors, and the addition of Swiss chards is perfect! Thank you, it definitely had a kick! I love Potato curries! Especially the dry kind with LOTS of spices!! 🙂 We will definitely be trying this out. I love that you have added swiss chard for a nice health boost. This will be wonderful with some tandoori roti. I really like how you didn’t blend the ingredients. They look so nice separated like this! It’s just the way it fell to be honest, but keeping the potatoes larger and using waxy potatoes tends to give the dish a little more structure than a regular saag aloo.